Tennessee at Georgia in the morning, Alabama at South Carolina in the afternoon and then a night of craziness as LSU visited Florida and Auburn went to Lexington looking for revenge against Kentucky. The Twitter updates are in blockquotes. Anything that needed further thought is bold. 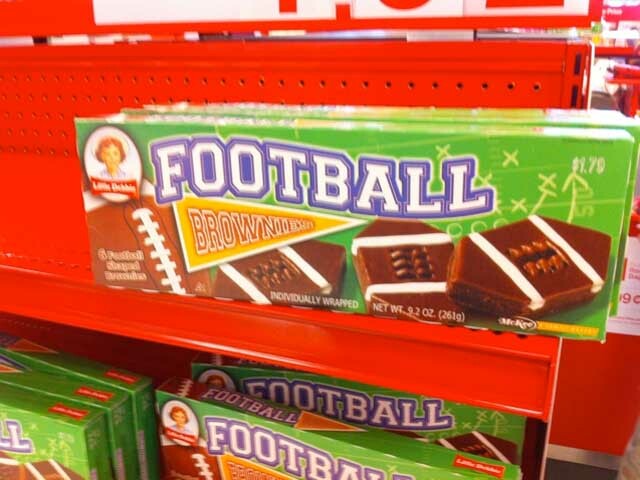 Les Miles eats these. Next week he’ll try to eat the real thing. Somehow, this will win him a football game. Mark Richt’s Bulldogs look like world-beaters today. Too bad they can’t book Tennessee for 12 games each fall. Can anyone explain the internal logic for ESPN3 blackouts? I mean, besides there not being one? Hey Alabama? South Carolina is calling. They’ve got your number. Somebody in Columbia send me a garnett Beat Bama shirt, mmkay? Just saw a guy in an Auburn shirt cheering at Brice Stadium. War Eagle, sir. Double bad news for Alabama: trailing at South Carolina and that big Penn State win looks less than impressive. Zook beat PSU badly today. When was the last time Alabama’s defense was gashed like this? Been awhile. Danielson Summary: Bama cheats, Carolina still gets it done. Alabama fans commence saying many things to soothe themselves for losing to Stephen Garcia. Tomorrow’s Tuscaloosa meme, today: Tide were looking ahead to Ole Miss. I think of early drives as something Auburn refuses to prepare, opting instead for the joy and challenge of mid-game adjustments. #wareagle I’m ready for any other rationale you might have on the subject, too. Meanwhile, Florida, on the alternative screen, show you why you should never wear orange jerseys. Florida is playing LSU not to lose. Which is working into Les Miles’ oddly crafted hands. So the first half of the third quarter was an excellent time to eat dinner. And if you are superstitious, I’m not having dessert. #wareagle Because my having food was clearly what caused the problem. That and whatever you were doing after the break. And whatever you’re doing, you really need to stop doing it during football because it was not helping matters. And we’re tied again, 34-34. I vote for a seven minute drive featuring Michael Dyer culminating in a @supurmario27 touchdown plunge. Auburn just put us all in the uncomfortable position of Bob Davie making sense. Hate when that happens. #wareagle When Davie is talking about being sensible on kickoff returns you know you’ve over-thought a play. We’re running yellow-37. That’s Cam scrambling around to make something happen. It is similar to colors green and red, and numbers 4-31. LSU, with seconds left, lines up for tying field goal, fakes it, drops it, and STILL gets the 1st down. Les Miles’ soul has been sold again. The play is being reviewed, but Les Miles is laughing because he knows the NCAA has NO RULES FOR HIS MIND. The Auburn finish was just an inevitability and not quite as dramatic as the Florida game. “They can spike it, run it out of bounds or throw it incomplete.” Or they can run the LESTER! We should start to consider the possibility that Les Miles is sane and brilliant and the rest of us are crazy. After the game Les Miles and are going to Vegas and betting it all on .5 turquoise and walking out with the roulette table! I changed the color because that makes it funnier. Not a bad Saturday, that. His previous From The Tweet Seats columns can be found here. His popular open letter to the Auburn University 2010 recruiting class can be found here. I believe the 3rd quarter is our group’s fault. We all sat down in different seats after halftime. Then I left the room right before Auburn’s incredible 7-minute game-winning drive and stayed away, coming back only between plays and always leaving again before the snap. The rest is Foot Lauderdale history. You’re welcome. But really, great Twitter synopsis of the day. War Eagle! That’s it. Assigned seats at Peggy’s party! I ate a couple miniature Reese’s cups. But the third quarter was really my fault. I actually turned to my wife in the stands and said, “Maybe we’ll see Barrett Trotter in the second half.” UGH. Van P, you win. It IS your fault.